Known only by their first names, the five members of Dasputnik hail from the former Finnish capital of Turku, where they first got together in 2005 as a jamming project called Mystery Space. They became Dasputnik during the following year, which also saw their first live performance. After two demos (titled Demo and Blatta Caverna), they finally released their debut album, Parapsychosis, in 2009, followed by Cyclokosmia in the spring of 2011. 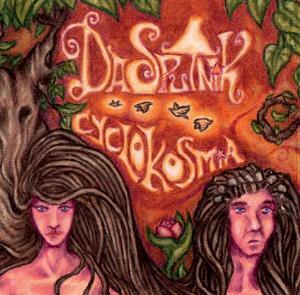 With its stunningly bright-hued artwork (apparently based on the Garden of Eden) and song titles such as “Cosmic Train to Anticreation”, Cyclokosmia proudly declares Dasputnik’s allegiance to the time-honoured school of psychedelic/space rock – which, in this second decade of the 21st century, is enjoying something of a revival both in Europe and in the US. Scandinavian countries, as is so often the case in the variegated world of progressive rock, seem to be at the forefront of this movement, with outfits such as Øresund Space Collective, My Brother the Wind and Dungen (to name but three) attracting quite a lot of international attention. Finland’s remarkable contribution to this thriving subgenre, while perhaps not large in terms of sheer number of bands, has been remarkable, includes names such as cult trio Kingston Wall in the early Nineties, and, in more recent times, Hidria Spacefolk and Taipuva Luotisuora. Many of the bands adopting the psych/space aesthetics, both in the Old and the New World, blend trippy jams in the iconic style of Gong, Steve Hillage and Ozric Tentacles with the harder-edged, fuzz-heavy suggestions typical of stoner rock – via the subgenre’s founding fathers Black Sabbath and Hawkwind. However, the average first-time listener will not fail to be impressed by the mature, almost understated quality of Dasputnik’s music. Rather than pushing screaming guitars to the forefront in quasi- metal fashion, the riffing is employed judiciously, often kept in the background to add some bite to the other instruments’ mellower, Eastern-tinged efforts. Various percussion instruments, including mallets and tubular bells, join their warm, organic sound to the swirling electronics that are a key ingredient of any self-respecting psych/space band’s toolkit. The impression of naturally flowing smoothness is compounded by the prominent role of Sini’s saxes, occasionally complemented by the solemn voice of the trombone. While, in compositional terms, the four tracks on Cyclokosmia share the typical features of the subgenre – developing slowly but relentlessly, with instruments playing in parallel and repeating the same tune with minor changes, with a rivetingly hypnotic effect (as exemplified by the stately closing track “Trinity Quadrilogy”) – the music is rendered in surprisingly sophisticated terms, with the instruments contributing their own individual voices, yet striving together to produce a harmonious whole. Sax and electric piano are responsible for injecting hefty doses of heady melody, balancing out the more free-form passages (as in the 12-minute “…Phantom Wakes”, the album’s longest track). Opener “Orbitary Volcano” is introduced by gentle acoustic guitar arpeggios with a faint Spanish flavour, then organ and synth take the lead, alternating with sax and electric guitar. Surprisingly, it is one of the two shorter tracks – the previously mentioned “Cosmic Train to Anticreation” – that packs the most variation in its nearly 8 minutes, juxtaposing harsh, churning guitar riffs with an almost funky bass line, then introducing a brisk, dance-like Eastern European motif as a surprise factor. Clocking in at under 40 minutes, Cyclokosmia (which was also released as a vinyl LP on the band’s own label, Art Safari Records) combines vintage psychedelic suggestions with thoroughly modern production values that enhance the mix of sophistication and intensity in Dasputnik’s music. While it does not substantially deviate from the well-established psychedelic/space rock canon, the album is nevertheless highly recommended to fans of the subgenre, and it also has the potential to appeal to most lovers of progressive rock, regardless of niches and labels. WOW!! great music from this band! Thanks for introducing me to such great music! You are very welcome! I knew you would find this band to your taste. Thank you so much for taking the time to read my reviews! Yes, Dasputnik are great, and this album really impressed me. They would richly deserve to get a slot at some fest here in the US. My review at least gave them some much-needed exposure.